Cut a Tree From a National Forest: Many National Forests will allow you to cut a Christmas tree from within the park, with the purchase of a permit. The number of permits is limited, so you’ll need to act quickly to get one. Expect to pay around $10 for each tree that you cut and carry out. Pricing and rules vary from one forest to the next. Check with the closest National Forest headquarters for all the particulars. Choose a Cheaper Variety: Slow-growing trees cost more per foot, so stick to a fast-grower. ​You best bet? Anything in the pine family. Scotch pines are a popular choice, and they’re almost always cheaper than fir or spruce. 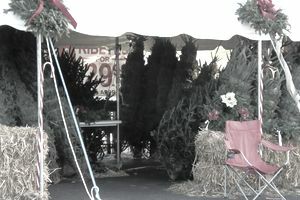 Buy a Pre-Cut Tree: It may seem backwards, but you’ll probably pay less if you let someone else cut your tree for you. So, skip the trip to the tree farm, and head to the nearest tree lot instead. It’s great when the easiest option happens to be the cheapest option, too. Haggle: See a tree you like, but not in love with the price tag? Then, ask for a better deal. If there’s a bald spot or another noticeable imperfection, use it to negotiate a discount. Shop Late: Wait to buy your tree until closer to Christmas, and sellers will be eager to cut you a deal. No one wants to be left with unsold trees. Shop Second-Hand: Thrift stores get flooded with artificial Christmas trees. Shop early for the best selection, and expect to save 75 percent or more off of regular retail. Other places to look: newspaper classified ads, Craigslist and yard sales. Use a Coupon: Michael’s and Hobby Lobby usually have coupons for 40 or 50 percent off one regular-priced item. Use one to nab your tree at a huge discount. Just think of it as making your own sale. Take Advantage of Black Friday/Cyber Monday sales: Do a bit of research to figure out who will have the best deal on artificial Christmas trees. Then, swoop in and grab one. If you shop online, you won’t even have to lug it home. Wait Until After Christmas: Squeeze one more year out of your current tree. Then, snag a new tree during the after-Christmas sales. Your patience will net you a 75-90% savings.